Anne Morse Hambrock Southeast Wisconsin: Harp Petting Zoo! The Harp Petting Zoo onstage at Bedford Hall UW Parkside. The three pedal harps belong to the University - 2 modern Grand Concert Venus harps and 1 vintage Lyon and Healy style 16 from 1927. Saturday March 24th UW Parkside hosted a Harp Petting Zoo. 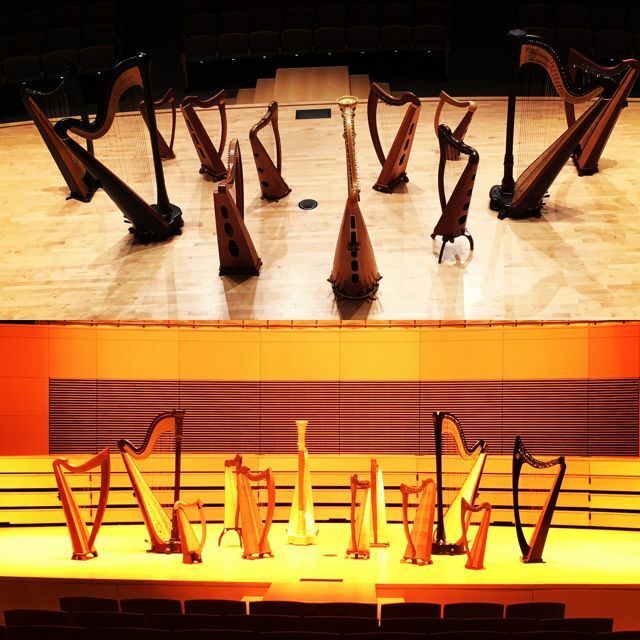 We had 12 harps on stage of all shapes and sizes - Harps with pedals, harps with levers, harps without levers, old harps, new harps - it was quite a sight to see them all when I set the stage the night before. I got the idea when the Kenosha Symphony took their instruments down to the harbor market a few years ago as part of an "Instrument Petting Zoo" to let folks get close to musical instruments in a new and interesting way. 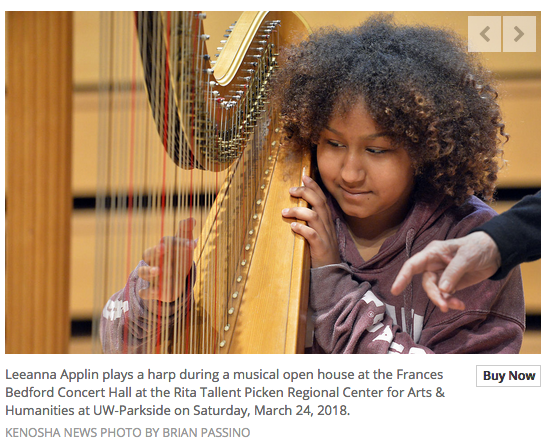 The "Zoo" was free and open to the public and more than 50 folks aged 3 to over 70, who had never touched a harp before, got to get up close and personal and play. It was so exciting to see the joy people get from "meeting" harps and I was thrilled there was so much interest. I could NOT have done it without the help of my current harp students who gave over 2 hours of their time to help answer questions about the harps and guide people in putting their hands on the strings. I also have to thank the staff at UW Parkside without whose help the event would not have been possible and all the folks in the Kenosha area media who got the word out ahead of time. Photo from today's story in the Kenosha News - please click the link to read the article and see more pictures. The Kenosha News sent a reporter and put together a wonderful story with photos that you can link to here. Thank you everyone - I'm pretty sure we will do this again! !